There are two types of digital camera disasters: those we bring upon ourselves and those of which we have no control. In this podcast I talk about both. One of the pitfalls that I warn to stay away from is canned air, and I recommend to use blower bulbs instead. My favorite is the Giottos Rocket Air Blaster. But even with the Rocket, be sure to use it with care since you're inside your digital SLR where all the sensitive components reside. I also find Ziploc bags very useful for protecting my cameras from humidity and condensation. Always have one with you that's large enough to contain your camera and lens. Finally, keep an eye out for firmware updates for your camera. Sometimes they add new features to your model, but often they fix problems and are well worth the effort of installing. Now that I've piqued your curiosity, it's time to listen to today's audio show titled, "Camera Mayhem - Self-Inflicted and Otherwise." You can download the podcast here (30 minutes). Making a good print is more science than art. The creative process happens before printing -- capturing and editing the image. When it's time to put it on paper, all we want is to take what we see on the monitor and output it. Why is that often so difficult? It doesn't have to be. 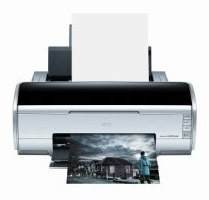 Just remember these three steps: calibrate your screen, image edit your photo, and configure your printer. If you don't have a colorimeter to calibrate your monitor, such as the Pantone Spyder, go to the Displays preference pane, click the Color tab, then click on the Calibrate button. Mac OS X will walk you through a pretty good calibration process. My tips are, use 2.2 for the Gamma setting and D65 for the White Point. Some folks have asked me about the new huey screen calibrator that costs less than $80 and includes nifty software for the Mac. It's fun to use, but I get better results from the Spyder, or even using the Displays preference pane calibrator. Now that your screen is displaying photos properly, open the image you want to print and make your basic exposure and white balance adjustments. Don't go crazy here, just tweak enough so the image looks natural and balanced. 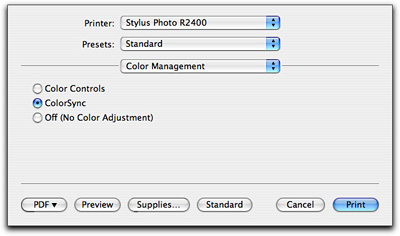 The final tip is to let your Mac control the color management, not the printer. Choose Colorsync in your printer dialog box (from the Color Management dropdown menu) and choose the correct type of paper from the Print Settings dropdown. If you have custom ICC Printer Profiles for your printer, load them and use 'em. This is one of the reasons that I like Epson printers so much. You can download ICC profiles from the Epson site. Now print. You'll be surprised how much better your output looks by just following these three basic steps. And in case you're curious, my current favorite "serious" printer is the Epson R2400. This is a great fine art unit that produces archival content that lasts for over 100 years. On the simple side of things, I really like the portable Dye Sub units made by Canon. I've been using a CP-300 for some time now for 4"x6" snapshots, and it works great. Now that I've piqued your curiosity, it's time to listen to today's audio show titled, "The Perfect Print." You can download the podcast here (26 minutes). Where do you draw the line when taking pictures of strangers on location? Do you always need permission first? Is a model release necessary for every shot that includes a person? What's the difference between assertive and obnoxious? During my last trip to Mexico, I had a good conversation with photographer-friend Ben Long that addressed these very topics. We were taking pictures in villages on the outskirts of Puerto Vallarta and found ourselves discussing what's appropriate and what isn't. 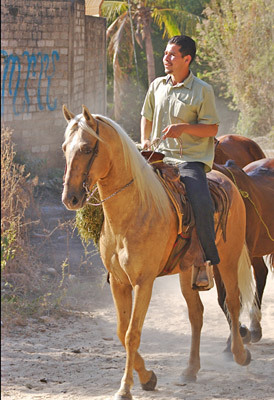 For example, the photo of the young man riding a horse was a situation where he knew I was taking photos of him. At one point he even smoothed his hair. I never asked formal permission, but did make eye contact before I took the shots. Since he is recognizable in this composition, I would not use this photo for commercial purposes. I didn't get a model release. But I am comfortable using this picture for teaching and reporting. The second picture, below, is of a woman washing clothes in a stream. I was on the other side of the water with a steep grade between us. I was not able to interact with her during the shoot. Even though she is not recognizable by my definition, I would not use this shot for commercial purposes either. Technically, I believe I could. But I would be more comfortable with a model release. So, I'll use this image for teaching and leave it at that. I have no absolute rules on this subject. I've included these images as part of the discussion. Keep them in mind as you listen to Ben and I talk about our adventures in Mexico. Now that I've piqued your curiosity, it's time to listen to today's audio show titled, "Street Shooting Etiquette." You can download the podcast here (22 minutes). Digital panoramas are a great way to broaden the width of your lens, add resolution to your final print, and better convey the feeling of the location. 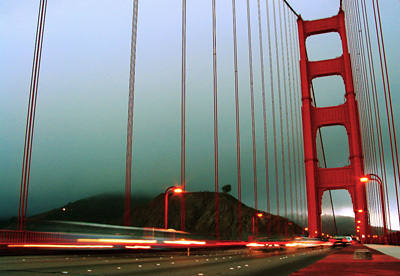 By following just a few simple techniques, you can begin creating your own panoramas today. The concept is to shoot a series of images with your digital camera, then stitch them together on the computer. At first, this might sound like a daunting task. But today's stitching software is so good that the procedure is almost automatic. I've been using Adobe's Photomerge software that's part of Photoshop Elements 4, which first came out for Windows, but now there's a Mac version too. (BTW: Photomerge is also part of Elements 3 on both platforms.) I also like the Photostitch software that comes bundled with Canon cameras. To use Photomerge, simply put the series of images you want to stitch together in a folder. Then open Photoshop Elements and choose: File > New > Photomerge. Direct Photomerge to your series of images, then follow the prompts. Before you know it, you'll have your own stunning panorama. You can apply this technique to indoor photos too, such as this image I captured inside Grand Central Station in New York with a 2-megapixel Canon Digital Elph compact camera. Now that I've piqued your curiosity, it's time to listen to today's audio show titled, "Killer Panoramas." You can download the podcast here (28 minutes). 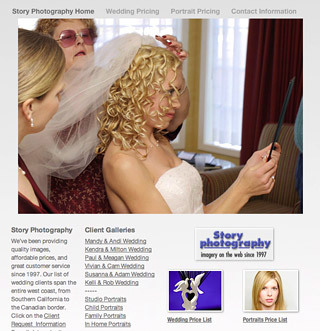 A well-designed website to show off your photography is an effective store front for photographers. In this podcast, I discuss the importance of having a web presence, for amateurs as well as professionals. The process of assembling your images for online publication has similar benefits to putting together a print portfolio. It forces you to cull your best work and think about your strengths and weaknesses as a craftsman and an artist. I then cover a few tips for building a site quickly. Today's web tools make this process much easier than a few years ago. 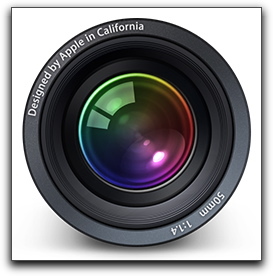 I recently redesigned my Story Photography web site in just 3 hours using Apple's new iWeb application. I wrote about this experience in the post titled, Putting iWeb to the Test. You might want to read this post, no only for my description of the process, but also because there are lots of comments, pro and con, about iWeb as a Web building application. Giles Turnbull also posted a good overview of three Mac web builder tools in his article, Mac OS X Web Builder Face-Off. Windows users have some solid options too. The leading contender is time-tested Dreamweaver 8, but it's a pricey $399 -- probably more than you want to spend. But fear not, you can get NVU, an open source web authoring tool for free. It's available for download for Windows, Linux, and Mac platforms. Now that I've piqued your curiosity, it's time to listen to today's audio show titled, "Build Your Own Photo Web Site." You can download the podcast here (33 minutes). Preparation is the key to success for wedding photography. First, make sure you've gone over a shot list with the bride (and groom if he's interested) to ensure that you're on the same page, literally. You can use this shot list as a starting point. Let the bride add and subtract items as it suits her event. Help her organize the group shots so you can maintain flow throughout the day. For example, don't take all of the group shots right after the ceremony if possible. It slows down the pace too much. Make sure your equipment is in order too. Bring a backup camera, flash, dedicated extension cord, plus lots of batteries, memory cards, and film (if film is part of the assignment). Test your setup before the actual shooting begins. This is especially important for flash photography. If you have the time, consider attending the rehearsal the night before. This gives you the opportunity to go over the shot list one more time with the bride, scout out the location, watch the ceremony, and meet the family. Plus, customers always seem so impressed when I show up for the rehearsal. It starts the event out on a good foot. Once the wedding is over, process you images in a timely manner. Couples like it when they can peek at their wedding pictures right after they get back from the honeymoon. Now that I've piqued your curiosity, it's time to listen to today's audio show titled, "Wedding Photography Tips." You can download the podcast here (33 minutes). Evaluative metering is the most popular mode for determining exposure on digital cameras. But many intermediate and advanced models have other options such as spot, partial, and center weighted. What's the difference between them? In this podcast I cover all four metering patterns to help you choose the best one for any given situation. Additionally, I talk about how the camera's light meter often sees the world differently than how it appears with your two eyes. I also announce the topic for the next photo assignment: Friends. As of the end of February, we're closing the books on the "Fur" assignment and beginning the next round for March. You can interpret "Friends" in any creative way you see fit. I hope you come up with something interesting, and submit it by the end of the month. Now that I've piqued your curiosity, it's time to listen to today's audio show titled, "Metering Modes." You can download the podcast here (32 minutes). While on a recent Geek Cruise to Mexico, I had the opportunity to talk with other photographers about their approach to these excursions, including what equipment they used. I found these discussions fascinating, and I hope you will too. I start off the show by telling a story about one of my adventures in Puerto Vallarta. 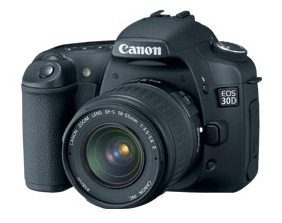 I then interview Lynn Lampert who had just purchased a Canon Digital Rebel XT. She talked about upgrading to a DSLR and trying to master it on location. Then, Don Tillman steps up to the mic and discusses his Kodak point and shoot. Don had some excellent traveler tips. He's been on four cruises. Then I had a nice chat with Ben Long, who is a friend of mine and who spent the day with me in Puerto Vallarta. Ben is a photographer and writer who contributes to Macworld Magazine and has authored some great books. 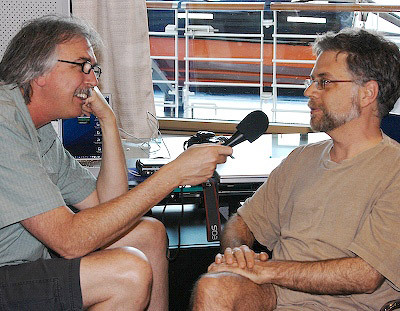 The photo on this page is me interviewing Ben on the ship (That's Ben on the right). One of the tools we talked about in the show was an image editor called Graphic Converter by Lemkesoft. I wanted to make sure you got the correct link to this cool app. You can download and try it for free. If you like Graphic Converter, it costs $30. Now that I've piqued your curiosity, it's time to listen to today's audio show titled, "Talking to the Shooters." You can download the podcast here (48 minutes).